The establishment of Kibabii University (KIBU) is traced to the origins of Kibabii teachers’ training college which is the precursor to the current Kibabii University. For more than twenty years, the proposed Kibabii Teachers Training College in Bungoma South district remained a mere dream. On 19th September, 2007, His Excellency President Mwai Kibaki graciously presided over a ground breaking ceremony at the proposed site. The History of a Teacher Training College in Kibabii dates back to the pre-independence period. The idea was initiated by the Mill Hill Fathers in 1932. This college trained P4’s between 1932 and 1942 and P3’s between 1958 and 1961 in the current St. Mary’s Kibabii High School. However, the college was moved to Eregi (Eregi Teacher Training College) in 1962. The idea of Kibabii Teachers College was revisited by the local community in 1978. The Government accepted the idea and the Ministry of Education through Projects Implementation Unit and African Development Bank Tender No. PIN/ADB/BLDG/01/94-95 on construction of Kibabii Primary Teachers Training College gave notice of prequalification of contractors. This resulted into M/C Metic General Contractors being awarded the contract to put Kibabii College in March 1997. However, the African Development Bank soon ceased funding the Kenya Education II project under which Kibabii Teachers College was to be financed. In 2007, the government gave Kibabii Teachers’ Training College a new lease of life. What started as a dream was slowly becoming a reality after President Kibaki’s ground breaking ceremony that led to the revival of the project. With the President’s nod, facilities belonging to Ministry of Gender and Social services in Tuuti within Kibabii area were leased to accommodate the first intake of students as construction works at the proposed site were embarked on. That was in December 2007. Due to limited space, second year students used to take lessons in tents provided by UNICEF. The construction works at the college were undertaken by MILICON’S LTD and his team of sub-contractors with a target that the college was to be fully operational by 25th of May 2011. The project had employed 700 workers thus contributing to employment creation in the area. 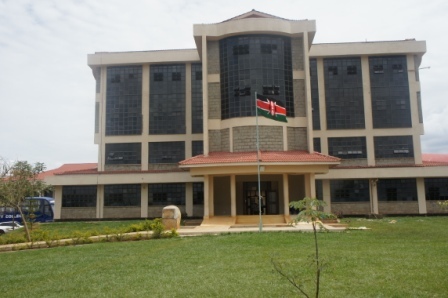 Due to a request by the leaders from Bungoma County, His Excellency, President Mwai Kibaki, declared that the newly constructed facilities for Kibabii Diploma Teachers’ College be converted to Kibabii University College. This was formalized by the Kenya gazette notice of 12th August 2011 that established Kibabii University College as a constituent college of Masinde Muliro University of Science and Technology via Legal Notice No.115 of August 2011. The University shall engage in the discovery of new knowledge and skills for addressing the scientific, socio-economic and technological concerns nationally, regionally and internationally. To produce graduates equipped with new knowledge, skills, attitudes and values critical to the posterity of human beings and society. To undertake research innovation and extension aimed at generating new knowledge, skills and strategies that shall drive sustainable development and wealth creation for the benefit of the community. To advance the intellectual and human resource capacity through training and team-building. To Publicize University programmes, activities and promote its public image. To practice prudent financial management. Kibabii University embodies the view that Science, Technology and Innovation are critical for sustainable utilization of material and human resources for the posterity of the universe. To be a global and dynamic University of excellence in Science, Technology and Innovation. To achieve excellence in generation, transmission and enhancement of new knowledge in Science, Technology and Innovation through quality Teaching, Research, Training, Scholarship, Consultancy and Outreach programmes.